This page includes basic information about the ships and how they were lost, a photo of the relevant panel(s) of the Tower Hill Memorial and information about those that lost their lives extracted from the CWGC database. In the table I have included information about those who served on the ships but who had a normal burial as this seems appropriate to me. In some cases further family information about the individuals may be available on the CWGC website - External Ref. #7. She was a 9,743 GRT steam cargo ship that survived the war. She was damaged on 28 July 1940 by aircraft bombing whilst at Aden. She was a 5,389 GRT steam refrigerated cargo ship that was sunk on 26 October 1940 by a torpedo and gunfire from German submarine U-31 at position 57° 30' N, 16° 31' W.
George	 Arrowsmith	 23	 24/10/1940	 Assistant Steward	 Merchant Navy	 United Kingdom	 Tower Hill Memorial	 Panel 69. Age 23. Son of Mrs. B. Arrowsmith of South Shields Co. Durham. Reginald Edney Dymore	 Brown	 53	 24/10/1940	 Fireman and Trimmer	 Merchant Navy	 United Kingdom	 Tower Hill Memorial	 Panel 69. Age 53. Son of James Dymore Brown and Harriet Dymore Brown of Earley Reading Berkshire. Charles Herbert	 Bryant	 32	 24/10/1940	 Able Seaman	 Merchant Navy	 United Kingdom	 Tower Hill Memorial	 Panel 69. Age 32. Son of Ann Bryant; husband of Elizabeth Ann Bryant of Brislington Bristol. William Georfie Wolferstan	 Chanter	 40	 24/10/1940	 Chief Officer	 Merchant Navy	 United Kingdom	 Tower Hill Memorial	 Panel 69. Age 40. Son of Francis Forbes Wolferstan Chanter and Charlotte Gertrude Chanter; husband of Winifred Mary Chanter of Redland Gloucestershire. Albert Edward	 Charlton	 18	 24/10/1940	 Assistant Cook	 Merchant Navy	 United Kingdom	 Tower Hill Memorial	 Panel 69. Age 18. Son of Joseph William and Frances A. Charlton of Bedminster Bristol. William	 Clare	 43	 24/10/1940	 Fireman and Trimmer	 Merchant Navy	 United Kingdom	 Tower Hill Memorial	 Panel 69. Age 43. Son of Robert and Ann Clare; husband of Beatrice Clare of Port Antonio Jamaica. John James	 Conlond	 28	 24/10/1940	 Assistant Steward	 Merchant Navy	 United Kingdom	 Tower Hill Memorial	 Panel 69. Age 28. Son of John Thomas Conlond and Elizabeth Conlond; husband of F. Conlond of Huyton Lancashire. Harold	 Dawe	 47	 24/10/1940	 Fireman and Trimmer	 Merchant Navy	 United Kingdom	 Tower Hill Memorial	 Panel 69. Age 47. Son of George and Bertha Dawe of Liverpool. Leslie	 Evans	 28	 24/10/1940	 Fireman and Trimmer	 Merchant Navy	 United Kingdom	 Tower Hill Memorial	 Panel 69. Age 28. Son of John and Jessie Edith Evans; nephew of Mrs. L. Smith of Bristol. Philip	 Everett	 28	 24/10/1940	 Fireman and Trimmer	 Merchant Navy	 United Kingdom	 Tower Hill Memorial	 Panel 69. Age 28. Son of William and Mary C. Everett. Ivor Raymond	 Faithfull	 19	 24/10/1940	 Sailor	 Merchant Navy	 United Kingdom	 Tower Hill Memorial	 Panel 69. Age 19. Son of Jane Elizabeth Faithfull of Bedminster Bristol. George Earle Winston	 Finzi	 24/10/1940	 Surgeon	 Merchant Navy	 United Kingdom	 Tower Hill Memorial	 Panel 69. Son of John A. and Ida L. Finzi of Montego Bay Jamaica. Patrick Dennis	 Fox	 33	 24/10/1940	 Baker	 Merchant Navy	 United Kingdom	 Tower Hill Memorial	 Panel 69. Age 33. Son of Joseph and Florence Fox of Calcutta India; husband of Eileen Fox of Llay Denbighshire. Howell Emanuel	 Gabe	 26	 24/10/1940	 Ordinary Seaman	 Merchant Navy	 United Kingdom	 Tower Hill Memorial	 Panel 69. Age 26. Son of Thomas Rees Gabe and Bessie Ruth Gabe of Pontypool Monmouthshire. Thomas Frank	 Harper	 22	 24/10/1940	 Junior Engineer Officer	 Merchant Navy	 United Kingdom	 Tower Hill Memorial	 Panel 69. Age 22. Son of Samuel Harris Harper and Jessie Harper of Liverpool. George Frederick	 Hawitt	 38	 24/10/1940	 Chief Cook	 Merchant Navy	 United Kingdom	 Tower Hill Memorial	 Panel 69. Age 38. Son of Richard John and Charlotte Clara Hawitt; husband of Winifred Hawitt of Liverpool. His brother Arthur also fell. Donald William	 Holliday	 29	 24/10/1940	 Able Seaman	 Merchant Navy	 United Kingdom	 Tower Hill Memorial	 Panel 69. Age 29. Son of David and Maude Holliday. David Alexander	 Jack, Mentioned in Despatches and Bar	 54	 24/10/1940	 Master	 Merchant Navy	 United Kingdom	 Tower Hill Memorial	 Panel 69. Age 54. Husband of Beatrice M. A. Jack of Belfast Northern Ireland. Formerly Lieut.-Comdr. R.N.R. Henry Bain	 Jones	 23	 24/10/1940	 Fourth Engineer Officer	 Merchant Navy	 United Kingdom	 Tower Hill Memorial	 Panel 69. Age 23. Son of Henry and Williamena Jones of Birkenhead. Daniel	 Kelly	 41	 24/10/1940	 Greaser	 Merchant Navy	 United Kingdom	 Tower Hill Memorial	 Panel 69. Age 41. Husband of Catherine Kelly of Liverpool. Thomas	 Kisley	 45	 24/10/1940	 Fireman and Trimmer	 Merchant Navy	 United Kingdom	 Tower Hill Memorial	 Panel 69. Age 45. Husband of I. M. Kisley of Camborne Cornwall. John William	 Lewis	 54	 24/10/1940	 Assistant Steward	 Merchant Navy	 United Kingdom	 Tower Hill Memorial	 Panel 69. Age 54. Son of Evan and Catherine Lewis; husband of Margaret Ellen Lewis. Alexander John	 Liddell	 38	 24/10/1940	 Assistant Steward	 Merchant Navy	 United Kingdom	 Tower Hill Memorial	 Panel 69. Age 38. Son of Robert and Catherine Liddell; husband of Marjorie Dalrymple Liddell of Bishopston Glamorgan. Allan	 Lindsay	 28	 24/10/1940	 Third Officer	 Merchant Navy	 United Kingdom	 Tower Hill Memorial	 Panel 69. Age 28. Son of Allan Lindsay J.P. and Isabella H. Lindsay; husband of Margaret C. L. Lindsay of Strone Argyllshire. William James	 Lloyd	 43	 24/10/1940	 Second Engineer Officer	 Merchant Navy	 United Kingdom	 Tower Hill Memorial	 Panel 69. Age 43. Son of Thomas and Mary E. Lloyd; husband of Elizabeth Lloyd of Liverpool. George	 Masson	 26	 24/10/1940	 Sailor	 Merchant Navy	 United Kingdom	 Tower Hill Memorial	 Panel 69. Age 26. Son of George Craig Masson and Helen Masson of Stonehaven Kincardineshire. William George	 Millett	 43	 24/10/1940	 Storekeeper	 Merchant Navy	 United Kingdom	 Tower Hill Memorial	 Panel 69. Age 43. Son of Henry and Liza Millett; husband of Mary Rosina Millett of Staple Hill Gloucestershire. Frank	 Moss	 60	 24/10/1940	 Chief Steward	 Merchant Navy	 United Kingdom	 Tower Hill Memorial	 Panel 69. Age 60. Son of William and Priscilla Moss; husband of Hilda Kate Moss of Bicester Oxfordshire. John	 Newsome	 50	 24/10/1940	 Greaser	 Merchant Navy	 United Kingdom	 Tower Hill Memorial	 Panel 69. Age 50. Husband of B. Newsome of Bournemouth. Hampshire. Frank Enoch	 Orpin	 38	 24/10/1940	 Third Engineer Officer	 Merchant Navy	 United Kingdom	 Tower Hill Memorial	 Panel 69. Age 38. Son of Robert and Margaret Orpin of Glasgow; husband of Elizabeth Orpin of Wick Caithness-shire. Alfred James	 Osborne	 20	 24/10/1940	 Fireman and Trimmer	 Merchant Navy	 United Kingdom	 Tower Hill Memorial	 Panel 69. Age 20. Son of John W. and Charlotte Osborne of Bedminster Bristol. George Frederick	 Piper	 27	 24/10/1940	 Assistant Steward	 Merchant Navy	 United Kingdom	 Tower Hill Memorial	 Panel 69. Age 27. Son of William and Emma Piper of Wavertree Liverpool; husband of Iris Piper of Taibach Port Talbot Glamorgan. James William Peat	 Purcell	 36	 24/10/1940	 Junior Engineer Officer	 Merchant Navy	 United Kingdom	 Tower Hill Memorial	 Panel 69. Age 36. Son of John and Mary Jane Purcell; husband of Annie Mary Purcell of Maryport Cumberland. Henry Albert	 Shaw	 47	 24/10/1940	 Assistant Steward	 Merchant Navy	 United Kingdom	 Tower Hill Memorial	 Panel 69. Age 47. Husband of Lilian Shaw of Liverpool. Samuel	 Smith	 26	 24/10/1940	 Fireman and Trimmer	 Merchant Navy	 United Kingdom	 Tower Hill Memorial	 Panel 69. Age 26. Husband of Olive Marjorie Smith of Chiswick Middlesex. Jack Leslie	 Takle	 15	 24/10/1940	 Deck Boy	 Merchant Navy	 United Kingdom	 Tower Hill Memorial	 Panel 69. Age 15. Son of Kate Takle of Bristol. Thomas John Elliot	 Watts	 19	 24/10/1940	 Second Radio Officer	 Merchant Navy	 United Kingdom	 Tower Hill Memorial	 Panel 69. Age 19. Son of Thomas Watts and of Henrietta W. Watts of Burnham-on-Sea Somerset. Arthur Joseph	 White	 50	 24/10/1940	 Chief Engineer Officer	 Merchant Navy	 United Kingdom	 Tower Hill Memorial	 Panel 69. Age 50. Son of Mr. and Mrs. Arthur George White; husband of Nina E. White of Pensby Cheshire. William James	 Wray	 51	 24/10/1940	 Carpenter	 Merchant Navy	 United Kingdom	 Tower Hill Memorial	 Panel 69. Age 51. Husband of Winifred Agnes Wray of Bootle Lancashire. She was a 35,738 GRT steam Passenger/ refrigerated cargo ship that survived the war. According to the CWGC database, the Date of Death of Mr. Oddy who was a barkeeper was 23 September 1941. Please see the entry for him on the Queries and Omissions page under 'Omissions' HERE. Rather confusingly, Mr. Appleton died with the loss of Sourabaya which is recorded on this website HERE. The reason for his being on the other vessel is not known - he may have been transferred but the records did not have time to be changed before he lost his life or possibly was in transit for some reason. I have found no information about Mr. Chase. George	 Appleton	 46	 27/10/1942	 Chef	 Merchant Navy	 United Kingdom	 Tower Hill Memorial	 Panel 99. Age 46. Son of William and Agnes Appleton; husband of Emmie Mary Appleton of Heswall Cheshire. Arthur	 Chase	 44	 15/03/1943	 Assistant Barkeeper	 Merchant Navy	 South Africa	 Durban (Stellawood) Cemetery	 Block LL. Grave 2. Age 44. Son of William and Alice Chase; husband of Acla Chase of Dagenham Essex. Walter	 Oddy	 38	 23/09/1941	 Barkeeper	 Merchant Navy	 United Kingdom	 Tower Hill Memorial	 Panel 69. Age 38. Husband of Joan Oddy of Liverpool. She was a 197 GRT steam cargo ship that sunk on 12 November 1941 after hitting a mine at Hilbre Swash, Dee Estuary, Liverpool Bay. Charles James	 Bowles	 64	 12/11/1941	 Chief Engineer Officer	 Merchant Navy	 United Kingdom	 Tower Hill Memorial	 Panel 69. Age 64. Husband of Elizabeth Bowles of Port Dinorwic Caernarvonshire. Robert	 Hutton	 37	 12/11/1941	 Master	 Merchant Navy	 United Kingdom	 Connahs Quay Cemetery	 Sec. T. Grave 11. Age 37. Son of Richard and Sarah Elizabeth Hutton; husband of Bessie Hutton of Connahs Quay. George	 Kennedy	 34	 12/11/1941	 Mate	 Merchant Navy	 United Kingdom	 Tower Hill Memorial	 Panel 69. Age 34. Husband of Mary C. Kennedy of Skerton Lancaster. She was a 935 GRT steam cargo ship that was sunk by aircraft bombing on 20 May 1940 off No. 4 Green Buoy Calais Roads. This would have been just before the evacuation of Dunkirk. Sidney James	 Gill	 41	 20/05/1940	 Second Officer	 Merchant Navy	 United Kingdom	 Tower Hill Memorial	 Panel 69. Age 41. Kings Commendation for Brave Conduct. Son of Hermon and Alice Gill; husband of Gladys Ellen Gill of Melbourne Victoria Australia. William	 Strawbridge	 28	 20/05/1940	 Able Seaman	 Merchant Navy	 United Kingdom	 Tower Hill Memorial	 Panel 69. Age 28. Son of Francis and Annie Strawbridge; husband of Ada Strawbridge of Mottingham Kent. John	 Woodhouse	 44	 20/05/1940	 Able Seaman	 Merchant Navy	 United Kingdom	 Tower Hill Memorial	 Panel 69. Age 44. Kings Commendation for Brave Conduct. Husband of Doris Woodhouse of Brixton London. She was a 5,880 GRT steam cargo ship that was scuttled on 4 August 1944 as a blockship in support of the Normandy Landings. I have found no information about how Mr. Clothier lost his life. She was a 4,380 GRT steam cargo ship that was sunk on 18 March 1941 by a torpedo fired by German submarine U-105 at position 17° 00' N, 21° 00' W.
Magnus	 Anderson	 23	 17/03/1941	 Able Seaman	 Merchant Navy	 United Kingdom	 Tower Hill Memorial	 Panel 69. Age 23. Son of James and Jemima Anderson. 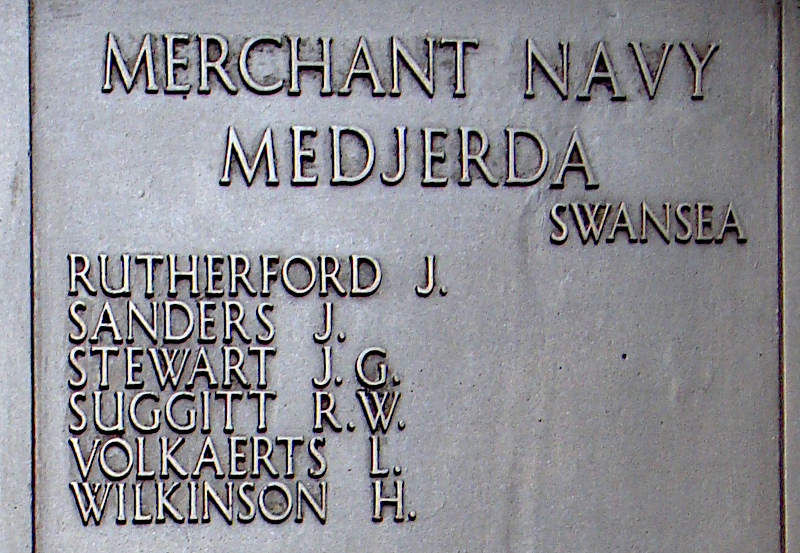 Robert	 Anderson	 43	 17/03/1941	 Donkeyman	 Merchant Navy	 United Kingdom	 Tower Hill Memorial	 Panel 69. Age 43. Husband of Elizabeth Anderson of Middlesbrough Yorkshire. Charles Edward	 Banks	 34	 17/03/1941	 Master	 Merchant Navy	 United Kingdom	 Tower Hill Memorial	 Panel 69. Age 34. Son of Edward Beasley Banks and Emma Jane Banks; husband of Hilda Banks of West Hartlepool Co. Durham. John Stonehouse	 Brown	 20	 17/03/1941	 Able Seaman	 Merchant Navy	 United Kingdom	 Tower Hill Memorial	 Panel 69. Age 20. Son of Benjamin Brown and of Amy Brown of Amble Northumberland. Alan	 Brownless	 15	 17/03/1941	 Mess Room Boy	 Merchant Navy	 United Kingdom	 Tower Hill Memorial	 Panel 69. Age 15. Son of Alexander and Alice V. M. Brownless of South Shields Co. Durham. Harry Cubitt	 Cozens	 21	 17/03/1941	 Fourth Engineer Officer	 Merchant Navy	 United Kingdom	 Tower Hill Memorial	 Panel 69. Age 21. Son of Alfred Herbert and Jane Ramsay Cozens of Blyth Northumberland. Robert Cheshire	 Crozier	 24	 17/03/1941	 Fireman and Trimmer	 Merchant Navy	 United Kingdom	 Tower Hill Memorial	 Panel 69. Age 24. Son of Mr. and Mrs. R. C. Crozier; husband of W. L. Crozier of South Shields Co. Durham. William	 Cushley	 38	 17/03/1941	 Fireman and Trimmer	 Merchant Navy	 United Kingdom	 Tower Hill Memorial	 Panel 69. Age 38. Son of William John and Margaret Cushley. James Harrison	 Dooley	 24	 17/03/1941	 Third Engineer Officer	 Merchant Navy	 United Kingdom	 Tower Hill Memorial	 Panel 69. Age 24. Son of William and Isobella Dooley. Frederick William	 Edge	 26	 17/03/1941	 Sailor	 Merchant Navy	 United Kingdom	 Tower Hill Memorial	 Panel 69. Age 26. Son of Thomas Henry Edge and of Evelyn Edge of Middlesbrough Yorkshire. Raymond George	 Franklin	 16	 17/03/1941	 Ordinary Seaman	 Merchant Navy	 United Kingdom	 Tower Hill Memorial	 Panel 69. Age 16. Son of George and May Franklin of Middlesbrough Yorkshire. William	 Gunn	 34	 17/03/1941	 Steward	 Merchant Navy	 United Kingdom	 Tower Hill Memorial	 Panel 69. Age 34. Son of Fred and Harriet Gunn. Norman	 Hancock	 27	 17/03/1941	 Second Radio Officer	 Merchant Navy	 United Kingdom	 Tower Hill Memorial	 Panel 69. Age 27. Son of William and Isabella Hancock of South Shields Co. Durham; husband of Christine Hancock of Jarrow Co. Durham. Robert Henry	 Henderson	 27	 17/03/1941	 Fireman and Trimmer	 Merchant Navy	 United Kingdom	 Tower Hill Memorial	 Panel 69. Age 27. Son of William and Marion Henderson of South Shields Co. Durham. 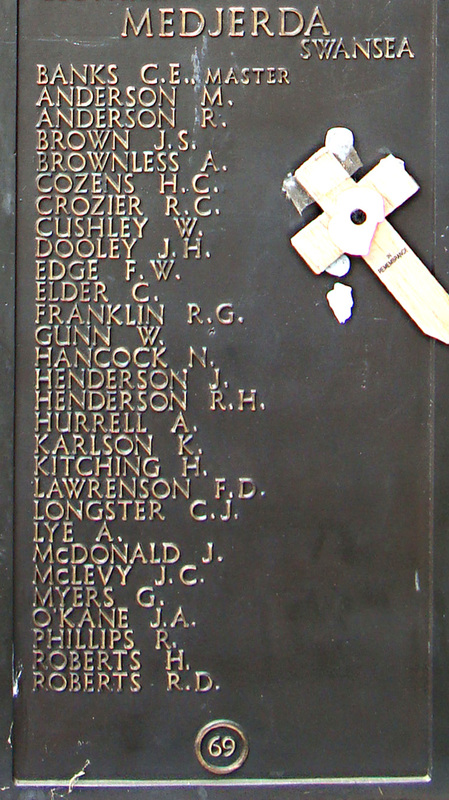 Hutton	 Kitching	 28	 17/03/1941	 Fireman and Trimmer	 Merchant Navy	 United Kingdom	 Tower Hill Memorial	 Panel 69. Age 28. Son of Thomas Henry and Janet Kitching; husband of Sarah Annie Kitching of West Hartlepool Co. Durham. Franklan Davison	 Lawrenson	 34	 17/03/1941	 Second Engineer Officer	 Merchant Navy	 United Kingdom	 Tower Hill Memorial	 Panel 69. Age 34. Husband of Jane Lawrenson of South Shields Co. Durham. Clemence James	 Longster	 34	 17/03/1941	 Able Seaman	 Merchant Navy	 United Kingdom	 Tower Hill Memorial	 Panel 69. Age 34. Son of Robert and Elizabeth Longster. Arthur	 Lye	 31	 17/03/1941	 Cook	 Merchant Navy	 United Kingdom	 Tower Hill Memorial	 Panel 69. Age 31. Son of William Henry and Beatrice Alice Lye; husband of Agnes Elizabeth Lye of Barry Glamorgan. George	 Myers	 53	 17/03/1941	 Chief Officer	 Merchant Navy	 United Kingdom	 Tower Hill Memorial	 Panel 69. Age 53. Son of Thomas and Mary Ellen Myers of Arthington Yorkshire; husband of Florence Myers of Pool Yorkshire. John Charles	 Mclevy	 19	 17/03/1941	 Third Radio Officer	 Merchant Navy	 United Kingdom	 Tower Hill Memorial	 Panel 69. Age 19. Son of John and Amy E. McLevy of Dundee. John Andrew	 Okane	 17	 17/03/1941	 Ordinary Seaman	 Merchant Navy	 United Kingdom	 Tower Hill Memorial	 Panel 69. Age 17. Son of Gladys Barnfather of Middlesbrough Yorkshire. Robert	 Phillips	 28	 17/03/1941	 Third Officer	 Merchant Navy	 United Kingdom	 Tower Hill Memorial	 Panel 69. Age 28. Son of James Noble Phillips and Margaret Phillips; husband of Vera Phillips of South Shields Co. Durham. Robert David	 Roberts	 29	 17/03/1941	 Boatswain	 Merchant Navy	 United Kingdom	 Tower Hill Memorial	 Panel 69. Age 29. Son of Richard and Mary A. Roberts of Mountain Ash Glamorgan. John George	 Stewart	 38	 17/03/1941	 Chief Engineer Officer	 Merchant Navy	 United Kingdom	 Tower Hill Memorial	 Panel 69. Age 38. Husband of Wilhelmina Stewart of South Shields Co. Durham. Robert William	 Suggitt	 26	 17/03/1941	 Galley Boy	 Merchant Navy	 United Kingdom	 Tower Hill Memorial	 Panel 69. Age 26. Son of Jonas Harper Suggitt and of Matilda Ann Suggitt of Middlesbrough Yorkshire. Hubert	 Wilkinson	 41	 17/03/1941	 First Radio Officer	 Merchant Navy	 United Kingdom	 Tower Hill Memorial	 Panel 69. Age 41. Son of Hugh and Isabel Wilkinson of Chorlton-upon-Medlock Manchester. She was a 11,076 GRT motor refrigerated cargo ship that was sunk on 2 April 1943 by German submarine U-129 at position 28° 05' N, 57° 30' W. At the time of the attack, the ship was travelling unescorted from Liverpool to Sydney via the Panama Canal carrying torpedoes and ammunition. She was struck by two torpedoes and sank within two minutes. Of the complement of 119 there were just 4 survivors. George James	 Adams	 35	 02/04/1943	 Carpenter	 Merchant Navy	 United Kingdom	 Tower Hill Memorial	 Panel 69. Age 35. Son of George and Alice Adams; husband of Ellen Frances Adams of Cowes Isle of Wight. George	 Aitken	 18	 02/04/1943	 Stewards Boy	 Merchant Navy	 United Kingdom	 Tower Hill Memorial	 Panel 69. Age 18. Son of David and Margaret Aitken of Liverpool. Charles William	 Almond, Mentioned in Despatches and Bar	 39	 02/04/1943	 Chief Refrigerator Engineer	 Merchant Navy	 United Kingdom	 Tower Hill Memorial	 Panel 69. Age 39. Son of Charles William and Emily Almond; husband of Doris Almond of Harton South Shields. Co. Durham. Henry Joseph	 Atkins	 22	 02/04/1943	 Junior Engineer Officer	 Merchant Navy	 United Kingdom	 Tower Hill Memorial	 Panel 69. Age 22. Son of Thomas and Alice Atkins of Dublin Irish Republic. Harry	 Blandford, D S C and Bar	 52	 02/04/1943	 Chief Engineer Officer	 Merchant Navy	 United Kingdom	 Tower Hill Memorial	 Panel 69. Age 52. Son of Henry Theodore and Elizabeth Blandford; husband of Helena May Blandford of Bebington Cheshire. John	 Bowles	 47	 02/04/1943	 Chief Cook	 Merchant Navy	 United Kingdom	 Tower Hill Memorial	 Panel 69. Age 47. Son of Thomas and Eliza Bowles. Michael Christopher	 Boyle	 39	 02/04/1943	 Greaser	 Merchant Navy	 United Kingdom	 Tower Hill Memorial	 Panel 69. Age 39. Son of Michael and Sarah Boyle; husband of Mary Margaret Boyle of Liverpool. William	 Bradshaw	 31	 02/04/1943	 Assistant Steward	 Merchant Navy	 United Kingdom	 Tower Hill Memorial	 Panel 69. Age 31. Adopted son of Mr. and Mrs. Matthew James Bradshaw of Walton Liverpool. William	 Camilleri	 31	 02/04/1943	 Assistant Steward	 Merchant Navy	 United Kingdom	 Tower Hill Memorial	 Panel 69. Age 31. Son of John and Carmela Camilleri of Msida Malta G.C. Alexander Cormack	 Christie	 29	 02/04/1943	 Electrician	 Merchant Navy	 United Kingdom	 Tower Hill Memorial	 Panel 69. Age 29. Son of William and Barbara Christie of Lossiemouth Morayshire. John	 Cook, D S M and Bar	 36	 02/04/1943	 Boatswain	 Merchant Navy	 United Kingdom	 Tower Hill Memorial	 Panel 69. Age 36. Son of Mrs. C. A. Cook of Mitcham Junction Surrey. Alec	 Coulthard	 22	 02/04/1943	 Greaser	 Merchant Navy	 United Kingdom	 Tower Hill Memorial	 Panel 69. Age 22. Son of Mr. and Mrs. F. G. Coulthard of Gladstone Queensland Australia. Richard Llewellyn	 Davies	 36	 02/04/1943	 Able Seaman	 Merchant Navy	 United Kingdom	 Tower Hill Memorial	 Panel 69. Age 36. Son of Kenneth J. and Rita M. Davies; husband of May Davies of Walton Liverpool. John Albert Edwin	 Gessey	 18	 02/04/1943	 Stewards Boy	 Merchant Navy	 United Kingdom	 Tower Hill Memorial	 Panel 69. Age 18. Son of James William and Minnie Margaret Gessey of Watford Hertfordshire. Anthony George	 Hall	 17	 02/04/1943	 Cadet	 Merchant Navy	 United Kingdom	 Tower Hill Memorial	 Panel 69. Age 17. Son of Arthur and Agnes Jessie Hall; ward of Mrs. A. Ashton Coker of Paddington London. James Bennett	 Hall	 57	 02/04/1943	 Master	 Merchant Navy	 United Kingdom	 Tower Hill Memorial	 Panel 69. Age 57. Husband of Ethel Hall of Crosby Lancashire. Kings Commendation for Brave Conduct. John Norman	 Hamilton	 36	 02/04/1943	 Second Engineer Officer	 Merchant Navy	 United Kingdom	 Tower Hill Memorial	 Panel 69. Age 36. Son of William and Helen Hamilton. Eric	 Hampson	 27	 02/04/1943	 Assistant Steward	 Merchant Navy	 United Kingdom	 Tower Hill Memorial	 Panel 69. Age 27. Son of Robert Mason Hampson and Elsie Annie Hampson of Southport Lancashire. James	 Haugh	 27	 02/04/1943	 Second Refrigerator Engineer	 Merchant Navy	 United Kingdom	 Tower Hill Memorial	 Panel 69. Age 27. Son of John Hamilton Haugh and Jeanie Kerr Haugh of Denny Stirlingshire. James Gallop	 Healey	 33	 02/04/1943	 Storekeeper	 Merchant Navy	 United Kingdom	 Tower Hill Memorial	 Panel 69. Age 33. Son of George Albert Gallop Healey and Gertrude Healey; husband of Lottie Healey of Liverpool. Clifford	 Henshall	 20	 02/04/1943	 Junior Engineer Officer	 Merchant Navy	 United Kingdom	 Tower Hill Memorial	 Panel 69. Age 20. Son of William Henshall and of Doris Henshall of Stretford Lancashire. Christopher	 Hogan	 36	 02/04/1943	 Greaser	 Merchant Navy	 United Kingdom	 Tower Hill Memorial	 Panel 69. Age 36. Son of Christopher and Alice Hogan; husband of Mary Hogan of Bootle Lancashire. Ronald Ian William	 Hutchinson	 21	 02/04/1943	 Writer	 Merchant Navy	 United Kingdom	 Tower Hill Memorial	 Panel 69. Age 21. Son of Albert William and Ethel Violet Hutchinson of Wallasey Cheshire. Howard	 Ince	 22	 13/08/1942	 Petty Officer Supply	 Merchant Navy	 United Kingdom	 Tower Hill Memorial	 Panel 69. Age 22. Kings Commendation for Brave Conduct. Son of Frederick and Laura Ince of Leytonstone Essex. Ralph Crookshank	 Inskip	 31	 02/04/1943	 Steward	 Merchant Navy	 United Kingdom	 Tower Hill Memorial	 Panel 69. Age 31. Son of Mary Crawford Inskip of South Shields Co. Durham. John Thomas	 Kelly	 22	 13/08/1942	 Greaser	 Merchant Navy	 United Kingdom	 Tower Hill Memorial	 Panel 69. Age 22. Son of John and Mary Kelly of Glasgow. John	 Lannon	 43	 02/04/1943	 Greaser	 Merchant Navy	 United Kingdom	 Tower Hill Memorial	 Panel 69. Age 43. Son of J. Lannon and of Mary A. Lannon of Watford Hertfordshire. Thomas	 Lawson	 26	 02/04/1943	 Greaser	 Merchant Navy	 United Kingdom	 Tower Hill Memorial	 Panel 69. Age 26. Son of Joseph and Elizabeth Lawson of Whitley Bay Northumberland. Eric Norman	 Leay	 17	 02/04/1943	 Stewards Boy	 Merchant Navy	 United Kingdom	 Tower Hill Memorial	 Panel 69. Age 17. Son of Joseph and Mary Leay of Chorley Lancashire. Thomas Sproat	 Leckie	 29	 02/04/1943	 Second Radio Officer	 Merchant Navy	 United Kingdom	 Tower Hill Memorial	 Panel 69. Age 29. Son of Adam and Marion Leckie; husband of Margaret Ann Leckie of Bishopbriggs Glasgow. Norman Alfred	 Leunig	 22	 02/04/1943	 Fourth Officer	 Merchant Navy	 United Kingdom	 Tower Hill Memorial	 Panel 69. Age 22. Son of Charles and Margaret Anne Leunig. William Lawson	 May	 20	 02/04/1943	 Fourth Engineer Officer	 Merchant Navy	 United Kingdom	 Tower Hill Memorial	 Panel 69. Age 20. Son of George William and Dorothy May of Cippenham Slough Buckinghamshire. Thomas	 Michaels	 16	 02/04/1943	 Galley Boy	 Merchant Navy	 United Kingdom	 Tower Hill Memorial	 Panel 69. Age 16. Son of Charles Teece Michaels and Susanah Mary Michaels of Liverpool. Philip	 Murphy	 38	 02/04/1943	 Able Seaman	 Merchant Navy	 United Kingdom	 Tower Hill Memorial	 Panel 69. Age 38. Husband of M. Murphy of Liverpool. Donald John	 Mackinnon	 27	 03/04/1943	 Able Seaman	 Merchant Navy	 United Kingdom	 Tower Hill Memorial	 Panel 69. Age 27. Son of Donald and Ann MacKinnon of Melbourne Victoria Australia. Gerald Columba	 Mccafferty	 27	 02/04/1943	 Able Seaman	 Merchant Navy	 United Kingdom	 Tower Hill Memorial	 Panel 69. Age 27. Son of Hugh and Elizabeth McCafferty. John Strong	 Mccall	 23	 02/04/1943	 Junior Engineer Officer	 Merchant Navy	 United Kingdom	 Tower Hill Memorial	 Panel 69. Age 23. Son of Brian and Kate McCall of Cleadon Sunderland Co. Durham. Philip	 Mcgovern	 21	 02/04/1943	 Ordinary Seaman	 Merchant Navy	 United Kingdom	 Tower Hill Memorial	 Panel 69. Age 21. Son of Thomas and Maria McGovern of Kinning Park Glasgow. Frederick	 Mcwilliam, D S M and Bar	 34	 02/04/1943	 Able Seaman	 Merchant Navy	 United Kingdom	 Tower Hill Memorial	 Panel 69. Age 34. Son of George and Jane McWilliam. Frank	 Oconnor	 17	 02/04/1943	 Ordinary Seaman	 Merchant Navy	 United Kingdom	 Tower Hill Memorial	 Panel 69. Age 17. Son of Joseph and Elizabeth OConnor of Liverpool. Herbert	 Oconnor, D S M and Bar	 41	 02/04/1943	 Chief Steward	 Merchant Navy	 United Kingdom	 Tower Hill Memorial	 Panel 9. Age 41. Son of J. M. and Lucy OConnor of Edmonton Middlesex. Christopher	 Oneill	 47	 02/04/1943	 Able Seaman	 Merchant Navy	 United Kingdom	 Tower Hill Memorial	 Panel 69. Age 47. Son of Michael and Ann ONeill of Birkdale Southport Lancashire; husband of Annie ONeill of Arklow Co. Wicklow Irish Republic. John	 Oneill	 18	 02/04/1943	 Deck Boy	 Merchant Navy	 United Kingdom	 Tower Hill Memorial	 Panel 69. Age 18. Son of Peter and Mary ONeill of Wallasey Cheshire. William	 Owen	 18	 13/08/1942	 Sailor	 Merchant Navy	 United Kingdom	 Tower Hill Memorial	 Panel 69. Age 18. Son of Mr. and Mrs. William H. Owen of Waenfawr Caernarvonshire. 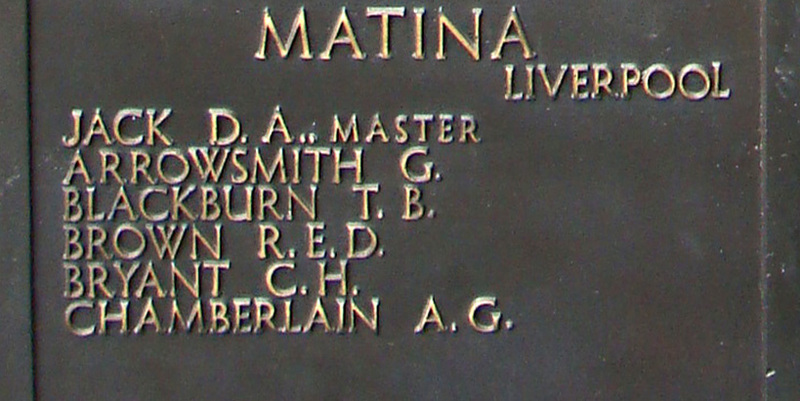 Peter Matthews	 Parsonage	 18	 02/04/1943	 Fourth Officer	 Merchant Navy	 United Kingdom	 Tower Hill Memorial	 Panel 69. Age 18. Son of Thomas and Madeline Parsonage of Nantwich Cheshire. Leslie Thomas	 Parsons, D S C and Bar	 38	 02/04/1943	 Chief Officer	 Merchant Navy	 United Kingdom	 Tower Hill Memorial	 Panel 69. Age 38. Son of Henry Thomas Parsons and of Clara Louise Parsons; husband of Lilian Parsons of Hull. William Henry	 Percival	 27	 03/04/1943	 Electrician	 Merchant Navy	 United Kingdom	 Tower Hill Memorial	 Panel 69. Age 27. Son of Charles and Annie Percival; husband of Mary Lydia Percival of Sunderland Co. Durham. John Samuel	 Pilkington	 26	 02/04/1943	 Greaser	 Merchant Navy	 United Kingdom	 Tower Hill Memorial	 Panel 69. Age 26. Son of T. H. and Elizabeth Pilkington of Bootle Lancashire. James Alfred George	 Pitkin	 23	 02/04/1943	 Able Seaman	 Merchant Navy	 United Kingdom	 Tower Hill Memorial	 Panel 69. Age 23. Son of Edward Henry Pitkin and of Emily Asman Pitkin of Stoke Poges Buckinghamshire. Henry	 Rice	 20	 02/04/1943	 Sailor	 Merchant Navy	 United Kingdom	 Tower Hill Memorial	 Panel 69. Age 20. Son of James and Marion Rice of Liverpool. William Edward	 Richards	 31	 02/04/1943	 Second Officer	 Merchant Navy	 United Kingdom	 Tower Hill Memorial	 Panel 69. Age 31. Kings Commendation for Brave Conduct. Son of Charles Edward and Ethel Richards; husband of Mary Richards of Barry Island Glamorgan. Stanley	 Rippon	 27	 02/04/1943	 Senior Fourth Engineer Officer	 Merchant Navy	 United Kingdom	 Tower Hill Memorial	 Panel 69. Age 27. Son of Mr. and Mrs. F. Rippon of Devonport Auckland New Zealand. Harry Ferguson	 Senior	 21	 02/04/1943	 Third Officer	 Merchant Navy	 United Kingdom	 Tower Hill Memorial	 Panel 69. Age 21. Son of Allen Henry Senior and of Cissie Senior of Wakefield Yorkshire. Patrick	 Sheehan	 27	 02/04/1943	 Able Seaman	 Merchant Navy	 United Kingdom	 Tower Hill Memorial	 Panel 69. Age 27. Son of Patrick and Annie Sheehan of Berehaven Co. Cork Irish Republic. Frederick	 Smith	 29	 02/04/1943	 Assistant Cook	 Merchant Navy	 United Kingdom	 Tower Hill Memorial	 Panel 69. Age 29. Son of Walter and Jane Smith of Liverpool; husband of Lilian Smith of Liverpool. Harold	 Treliving	 40	 02/04/1943	 Senior Second Engineer Officer	 Merchant Navy	 United Kingdom	 Tower Hill Memorial	 Panel 69. Age 40. Husband of Gladys Victoria Treliving of South Shields Co. Durham. Daniel	 Walker	 39	 13/08/1942	 Greaser	 Merchant Navy	 United Kingdom	 Tower Hill Memorial	 Panel 69. Age 39. Husband of Elizabeth Walker of Stevenston Ayrshire. Eric	 Whipp	 26	 02/04/1943	 Junior Engineer Officer	 Merchant Navy	 United Kingdom	 Tower Hill Memorial	 Panel 69. Age 26. Son of Levi and Amy Whipp of Southport Lancashire. 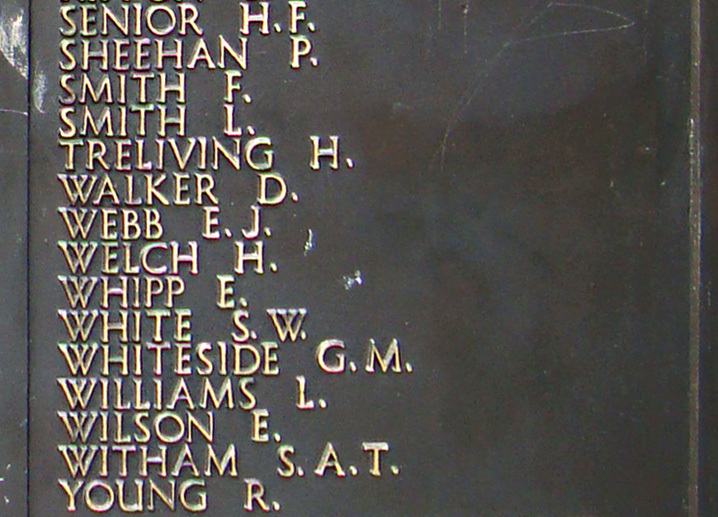 Selwyn William	 White	 28	 02/04/1943	 Senior Third Engineer Officer	 Merchant Navy	 United Kingdom	 Tower Hill Memorial	 Panel 69. Age 28. Son of William John and Frances White of Auckland City New Zealand. Leslie	 Williams	 20	 05/09/1940	 Able Seaman	 Merchant Navy	 United Kingdom	 Tower Hill Memorial	 Panel 69. Age 20. Son of Owen T. and Daisy E. Williams of Roby Lancashire. Ernest	 Wilson	 22	 02/04/1943	 Assistant Steward	 Merchant Navy	 United Kingdom	 Tower Hill Memorial	 Panel 69. Age 22. Son of Charles and Alice Carlisle Wilson of Wavertree Liverpool. Soren Albert Terkelsen	 Witham	 26	 02/04/1943	 First Radio Officer	 Merchant Navy	 United Kingdom	 Tower Hill Memorial	 Panel 69. Age 26. Son of Edgar and Magdalena Petrea Witham; husband of Edna Witham. Reginald	 Young	 31	 02/04/1943	 Able Seaman	 Merchant Navy	 United Kingdom	 Tower Hill Memorial	 Panel 69. Age 31. Son of Mr. and Mrs. A.H. Young of Liverpool. She was a 5,319 GRT steam cargo ship that was sunk on 28 December 1942 by torpedoes fired by German submarine U-225 at position 43° 27' N, 27° 15' W.
Augustus Charles	 Bond	 32	 28/12/1942	 Able Seaman	 Merchant Navy	 United Kingdom	 Tower Hill Memorial	 Panel 69. Age 32. Husband of Muriel Susannah Bond of Newport Monmouthshire. Reginald Thomas Augustus	 Collyer	 17	 28/12/1942	 Assistant Steward	 Merchant Navy	 United Kingdom	 Tower Hill Memorial	 Panel 69. Age 17. Son of Reginald Thomas Collyer and Annie Edith May Collyer of Holland Park London. Patrick	 Fennell	 60	 28/12/1942	 Able Seaman	 Merchant Navy	 United Kingdom	 Tower Hill Memorial	 Panel 69. Age 60. Son of Robert and Mary Fennell; husband of Mary Fennell of Crosshaven Co. Cork Irish Republic. Kenneth Henry	 Hicks	 19	 28/12/1942	 Fireman	 Merchant Navy	 United Kingdom	 Tower Hill Memorial	 Panel 69. Age 19. Son of Joseph Thomas Hicks and Gertrude Hannah Hicks of Newport Monmouthshire. James	 Mahoney	 31	 28/12/1942	 Able Seaman	 Merchant Navy	 United Kingdom	 Tower Hill Memorial	 Panel 69. Age 31. Son of Patrick and Kate Mahoney of Glandore Co. Cork Irish Republic. 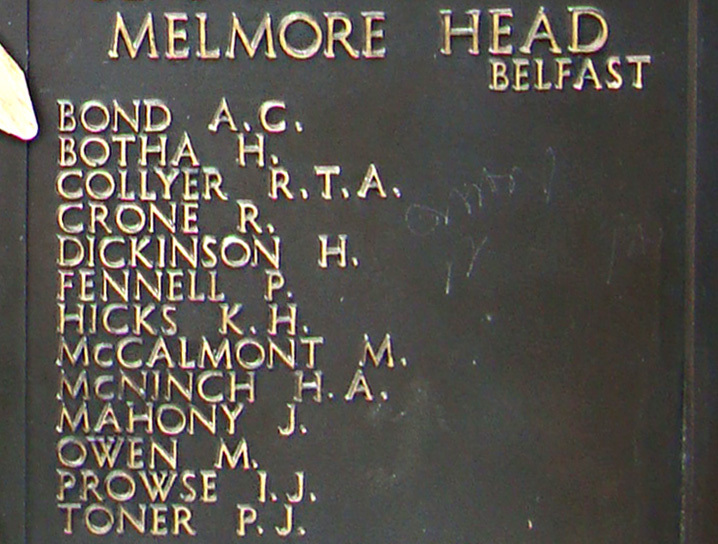 Mariott	 Mccalmont	 44	 28/12/1942	 Storekeeper	 Merchant Navy	 United Kingdom	 Tower Hill Memorial	 Panel 69. Age 44. Husband of Susan McCalmont of Eden Carrickfergus Co. Antrim Northern Ireland. Herbert Alexander	 Mcninch	 41	 28/12/1942	 Chief Engineer Officer	 Merchant Navy	 United Kingdom	 Tower Hill Memorial	 Panel 69. Age 41. Son of Mr. and Mrs. R. A. McNinch. Melvyn	 Owen	 18	 28/12/1942	 Fireman	 Merchant Navy	 United Kingdom	 Tower Hill Memorial	 Panel 69. Age 18. Son of William J. and Beatrice M. Owen of Newport Monmouthshire. Ivor James	 Prowse	 19	 28/12/1942	 Assistant Steward	 Merchant Navy	 United Kingdom	 Tower Hill Memorial	 Panel 69. Age 19. Son of Frederick W. and A. D. Prowse of Newport Monmouthshire. His brother William Frederick also fell. John James	 Scott	 42	 16/06/1945	 Able Seaman	 Merchant Navy	 United Kingdom	 Newport (St. Woolos) Cemetery	 Block 85. Grave 32. Age 42. Son of Thomas and Emily Scott; husband of Hilda Evelyn Scott of Newport. She was a 1,653 GRT steam cargo ship that sunk on 15 March 1940 after hitting a mine at position 51° 21' N, 02° 13' E.
Roy Hamilton Thomas	 Avery	 15/03/1940	 Able Seaman	 Canadian Merchant Navy	 Canada	 Halifax Memorial	 Panel 17. James	 Clark	 26	 15/03/1940	 Boatswain	 Merchant Navy	 United Kingdom	 Tower Hill Memorial	 Panel 70. Age 26. Son of John and Jean Clark of Muirhouses West Lothian. Robert Paget	 Macdonald	 15	 15/03/1940	 Ordinary Seaman	 Merchant Navy	 United Kingdom	 Tower Hill Memorial	 Panel 70. Age 15. Son of John Gillon Macdonald and Annie Paget Macdonald of Leith Edinburgh. James K.	 Martin	 22	 15/03/1940	 Able Seaman	 Merchant Navy	 United Kingdom	 Tower Hill Memorial	 Panel 70. Age 22. Son of Robert and Marjorie Martin of Grangemouth Stirlingshire. His brother Edward Kelly Martin also fell. Neil	 Maclean	 41	 15/03/1940	 Chief Officer	 Merchant Navy	 United Kingdom	 Tower Hill Memorial	 Panel 70. Age 41. Son of Neil and Flora MacLean; husband of Mary MacLean of Isle of Canna. Alexander	 Paxton	 50	 15/03/1940	 Steward	 Merchant Navy	 United Kingdom	 Tower Hill Memorial	 Panel 70. Age 50. Son of William Walker Paxton and of Catherine Paxton of Victoria London. 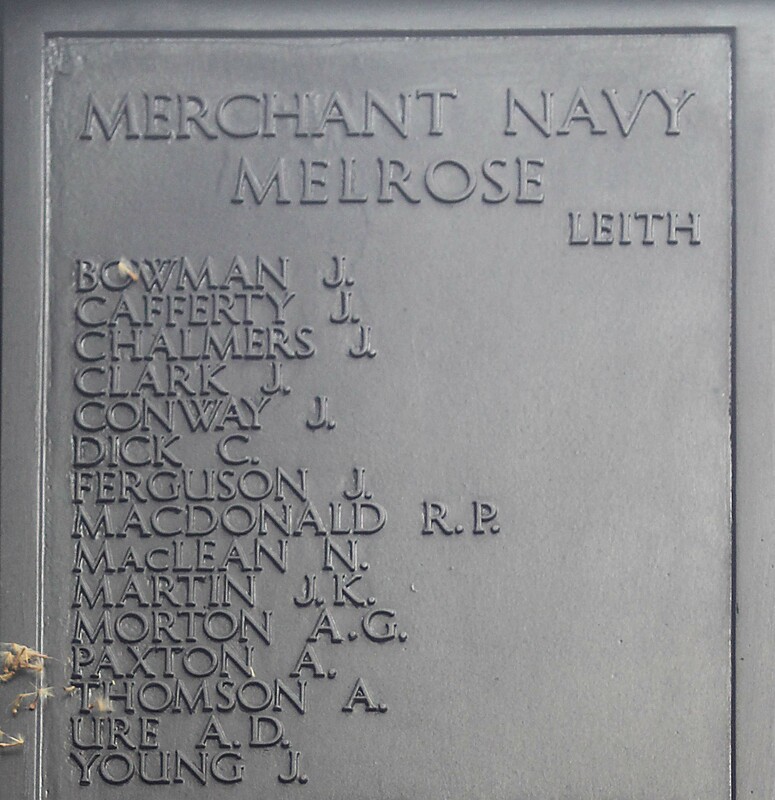 Alexander	 Thomson	 32	 15/03/1940	 Second Officer	 Merchant Navy	 United Kingdom	 Tower Hill Memorial	 Panel 70. Age 32. Son of James and Maria Thomson; husband of Amelia Paterson Thomson of Paisley Renfrewshire. Andrew Dow	 Ure	 22	 15/03/1940	 Third Engineer Officer	 Merchant Navy	 United Kingdom	 Tower Hill Memorial	 Panel 70. Age 22. Son of William and Agnes Dow Ure of Falkirk Stirlingshire. James	 Young	 19	 15/03/1940	 Able Seaman	 Merchant Navy	 United Kingdom	 Tower Hill Memorial	 Panel 70. Age 19. Son of Thomas and Mary R. S. Young of Stenhousemuir Larbert Stirlingshire.